"Orange sherbet, fruit juices, 7UP, ginger ale, and pumpkin spice make a festive holiday punch." Add ingredients to a 1 gallon punch bowl. 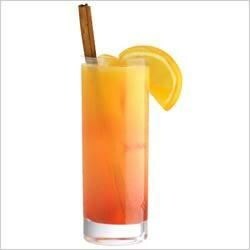 Garnish the punch bowl with lemon, lime, and orange slices, cinnamon sticks, and a touch of pumpkin spice. 7UP, CANADA DRY and HAWAIIAN PUNCH are registered trademarks of Dr Pepper/Seven Up, Inc. ©2012 Dr Pepper/Seven Up, Inc.
this is good, but does not save well. We made this for Thanksgiving and it was a huge hit. We should have gotten enough for two batches, it was gone in a flash. Delicious! Made this punch without alcohol for teenage daughters Christmas party. It was a big hit! My only regret is that I did not double the recipe. It was awesome my family loved this.